Riverkeeper began its second half century with perhaps our most successful year ever. The victories detailed below were all driven by the enormous growth in public support for clean water and safe energy, up and down the Hudson. As we plan our campaigns for 2018 and beyond, we’ll need that support more than ever, given the mounting challenges facing our rivers and drinking water supplies. 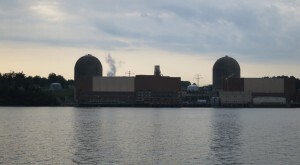 Indian Point will close! Riverkeeper made good on one of its biggest resolutions only days into the New Year, when it joined New York State and Entergy in a historic agreement to close the aging and increasingly dangerous Indian Point nuclear power plant by 2021. Soon, its operation will no longer threaten life in the Hudson River and the safety of 20 million nearby residents. Additionally, a Synapse Energy Economics study we co-commissioned proved we can count on plenty of clean replacement power once the plant goes offline. We pushed NYS to go BIG on clean water. After Riverkeeper urged Governor Andrew Cuomo and state lawmakers to ramp up clean water infrastructure spending, they rose to the occasion by making the state’s biggest commitment in a half-century, with the $2.5 Billion Clean Water Infrastructure Act. We also helped enact groundbreaking new clean drinking water legislation, known as the Emerging Contaminants Protection Act, setting new, best-in-nation protections for virtually every public water supply system in the state. 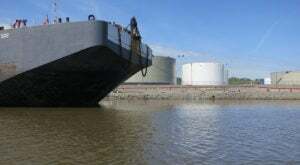 We’re winning the fight against oil barge ‘parking lots.’ After an unprecedented public outcry – 10,000 comments calling for protection of the Hudson – the U.S. Coast Guard shelved the tug and barge industry’s request to drastically expand long-term anchorage grounds for oil barges and other commercial vessels. Riverkeeper continued its defense of the river during an extraordinary Coast Guard safety analysis of river navigation, where we had a prominent seat at the table. 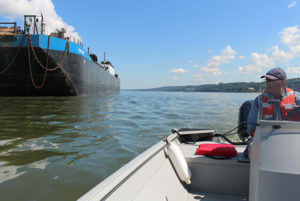 At the state level, Riverkeeper helped win legislation that will limit where oil tankers can move on the Hudson. Restoring safe drinking water in Newburgh. Riverkeeper continues to fight for Newburgh’s 29,000 residents and their water supply, contaminated by the toxic chemical PFOS. More than 2,200 people have had their blood tested, new protections for the city’s reservoir are being added and a state-led comprehensive Source Water Protection initiative is gathering steam, with Riverkeeper’s support. Holding back fossil fuel expansion. Riverkeeper continues to battle dangerous fossil fuel shipments via pipeline, barge and rail. On the fracked gas front, we helped stop the Constitution Pipeline and ban fracking in the Delaware River basin. We also won a major court victory slamming the door on Global Partners’ plan to expand its Albany terminal to ship tar sands crude oil on the Hudson by rail and barge. Gowanus Canal dredging begins. 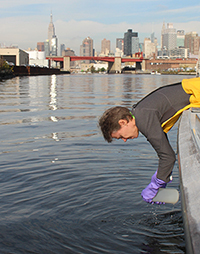 Riverkeeper fought a long and successful battle to get the Gowanus designated as a Superfund site, working with nearby communities to push government agencies toward the quickest, most thorough cleanup possible. This fall, we reached a milestone when EPA began dredging 20,000 cubic yards of toxic sludge from the canal, one of the most polluted waterways in the U.S.
We’re battling with the state over lax industrial agriculture permits. Riverkeeper is fighting for stronger measures against disease-causing pollution from industrial animal farms. Together with local and national partners, we served the state with a lawsuit challenging a deeply-flawed multi-farm permit that could allow countless tons of animal waste to be discharged into New York waterways. On the legislative side, we successfully pushed for $50 million to help farmers establish better practices to properly dispose of these wastes. We expanded our influential water sampling program. With 175 community scientists and 4,800 samples from 440 locations, our sampling program continues to grow. Across the region, groups like the Wallkill River Watershed Alliance and the Roe Jan Watershed Community are rallying, data in hand, to protect and restore their waterways. Riverkeeper also supported new research on microplastic and other unregulated contaminants, together with major university partners. Municipalities join to protect their drinking water supply. 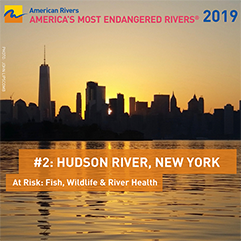 Riverkeeper partnered with the seven river communities that take their drinking water from the Hudson on a “source water protection” campaign to protect this critical freshwater resource, which serves over 100,000 New Yorkers. These communities have been meeting since the summer, sharing best practices and completing Riverkeeper’s “drinking water protection scorecard,” which we hope to make a statewide model. Making NYC swimmable again. 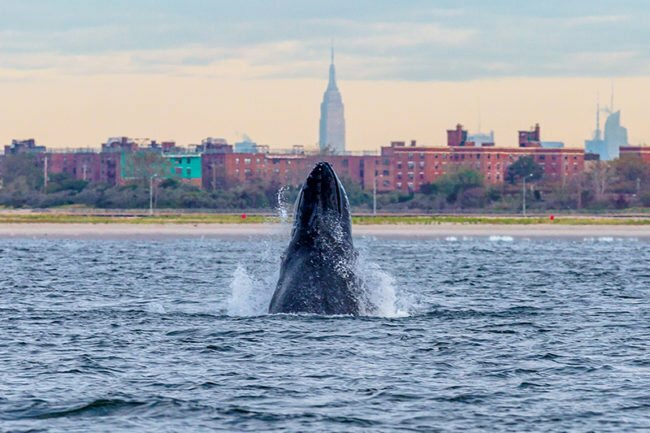 We are part of a group of nonprofits that hit EPA Administrator Scott Pruitt with a federal lawsuit aimed at better protecting the rapidly increasing number of people who swim and boat in NYC waters. After months of interaction by EPA, we’re now in court, arguing for more scientifically defensible standards. 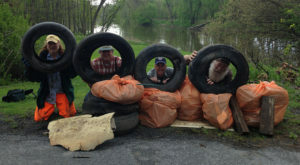 The Riverkeeper Sweep’s lasting impact. Our annual day of service, which inspires thousands of volunteers to clean up tons of trash from the river, is paying long-term dividends—many previously-blighted sections of the river are now consistently clean and no longer need annual cleanups. In 2018, we’ll focus on a number of new stretches of shoreline in desperate need of “Sweep” coverage. Newtown Creek clean water investment skyrockets. Riverkeeper and The Newtown Creek Alliance have doggedly advocated for infrastructure upgrades to mitigate pollution from combined sewer overflows (CSO), one of the largest sources of pollution impacting Newtown Creek. Our work on the Newtown CSO “long-term control plan” bore fruit, when New York City pledged over $600 million to cut pollution into the Creek by over 60 percent. Fighting industrial pollution. We are constantly on patrol, identifying industrial facilities operating in violation of the Clean Water Act and forcing them to obtain permits and adopt best practices. 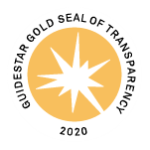 In 2017, as part of our NYC-focused stormwater initiative with outside counsel, we completed eight such cases, cutting pollution and provided $390,000 in fees and environmental benefits.